The MICHELIN Commander II creates a new standard with regard to durability, yet without making any compromises in terms of wet weather grip, maneuverability or stability. This performance balance provides yet another eloquent illustration of Michelin's research and development philosophy: no performance gain to be achieved on one front to the detriment of another. Rubber compounds provide remarkable wet grip, without compromising durability. Adt (Amplified Density Technology) provides a highly dense more rigid tire casing which helps deliver excellent feedback and handling in all conditions. The square bead-wire package improves casing rigidity, handling and ease of installation. Silica Rain Technology (SRT) which integrates silica into the compound of the tire tread, while the MICHELIN Commander II's tread pattern has been designed to prevent all forms of uneven wear. The exclusive architecture of the MICHELIN Commander II brings both maneuverability and stability. The tire's more rigid, high-density carcass improves maneuverability, while the aramid fiber crown ply of the rear tire enhances resistance and lightness for impeccable stability, even at high speeds. The numerous longitudinal grooves of the tire's tread pattern optimize water dispersal for outstanding wet weather grip. i love these tires on my 1996 roadking. great wear and stick in the florida rain. only tire i will run. on 2nd front and 3rd rear i put a lot of miles on. replace the front on everyother rear tire. getting a set for my street glide. always buy here best price and great service! This is a rehash of my review for the rear tire. I have these tires on my 99 Honda. I had them on my 08 Ultra Clssic (R.I.P.). I wore out the Dunlops that were on my 12 Ultra Limited and just replaced them with these Commader II’s. These are the stickiest tires I’ve ever seen. They grip the road like no other. The set on my Honda have 10K on them and they show no appreciable wear. These are the tires I recommend to anyone who asks my opinion, regardless of what kind of motorcycle they ride. I checked prices from at least eight sellers and Rocky Mountain ATV/MC beat the closest competitor by $30! Thanks, Rocky Mountain! Great tire... high miles... low price, what's not to love? Been running Commander 2s for a while now on my 2011 ultra classic. I love them. High mileage tire, stout sidewall so even 2uploaded with gear they handle great. These are the only tires I put on my 2002 shadow! They do an excellent job for a great price. Great tires. Love them. Way better than the junk dunlop e3 that was on it from factory. I had to go with a little taller tire on the rear but i haven't noticed a difference. Excellent tire, smooth ride. great handling, long wearing. The service from Rocky Mtn was superb. Liked this replacement much better than Dunlop. Lasted longer. Best price and quality around.I get the most mileage from these tires.Fast shipping. The tires we wanted was a perfect fit for my Harley. I would definitely order from this fantastic company again. As a matter of fact I have ordered many more. I can get 20k out of these on the western Colorado oil chip roads. I got 29,000 miles out of my Front Michelin tire . I got 20,000 out of my rear . Compare to my Dunlops I got 10,000 miles out of the front and 4,500 out of the rear . Enough said. My bike has never handled better. 100% better tire than my previous tires. I'm on my 3rd set now. 2013 Road King. These tires are great on dry roads bw they twisties in the mountains or the long high speed runs down the freeway - tires hold and provide a smooth ride. In the rain they tend to hydroplane a bit. I've gitten squirrely a couple of times due to this. Tend to get 13 - 15k miles out of my front, and by then there's cupping on the rear so I swap both. I have purchased this tire before for my two motorcycles and and love how in handles on all road conditions. I went to a bigger front rim, that's why I purchased another one. My order was filled quickly and tire arrived at my house quickly. I have run this tire for many years , both front and rear. This is the best tire with a price that won't break the bank . 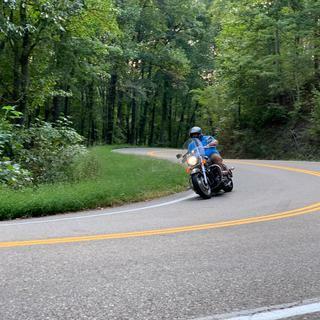 Ride control is really good on a H D cruiser / touring , with the tread pattern there isn't any worry of following road grooving . Solid all around tire, decent read life, good wet surface traction, decent read life. I chose this tire for my 2012 Electra Glide Limited because the original tire had worn out after 18K miles. I had to replace the rear tire after only 10K miles so I wasn't a big fan of the OEM Dunlops. I had heard only good things about the Michelin Commander II so that's what I went with for the rear tire. That was two years ago and I've been very please with the performance and wear since then. When I looked for the best price on a new front tire I kept coming back to Rocky Mountain ATV. I also managed to catch it on sale so added bonus! 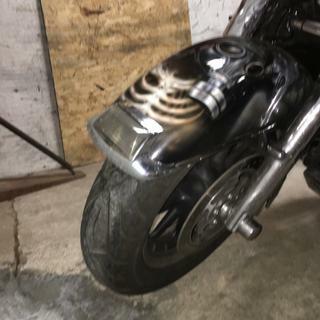 I run these on my 2012 Road King and LOVE them. I have about 4k miles on them and can't even tell they've been used yet. The ride is absolutely amazing and smooth. Excellent traction whether dry or wet. They may cost a bit more than some other brands but I can tell already they are going to last plenty long to make up for the slightly higher price. I LOVE THE MICHELIN COMMANDER II TIRES I PUT ON MY 2014 HARLEY STREET GLIDE .MY HARLEY NOW HAS EXCELLENT TRACTION IN WET OR DRY WEATHER. THIS MAKES FOR GOOD HANDLING. GREAT TIRES FOR A GOOD PRICE AND VALUE. I WOULD HIGHLY RECOMMEND THEM TO ANYONE LOOKING TO GET NEW TIRES. 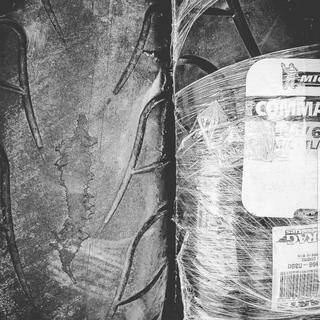 The perfect touring motorcycle tire. I will never buy another brand of tires for any bike that I own. I ride a Roadmaster, but it is not an available selection. The Commanders are outstanding long run tires, you do have to go up 1/2 inch on the rear as there are no 180/60 16 tests, but this has not been an issue. Customers keep asking for this tire over and over. Long wearing tread and great traction. Handling and tread life unbelievable. 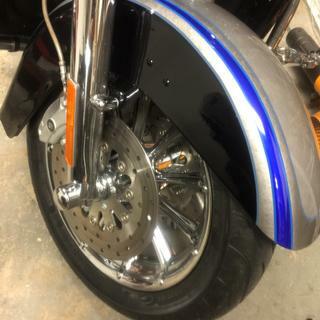 After going thru two sets of Dunlops on my Harley Davidson Streetglide a friend recommended the Michelin Commander II tires as he had been running them on his Road King and loved them. I have to say they ride smoother, quieter, and last longer than my previous Dunlops. great tires over all and so far great even wear! Bought front and rear commander 11 in late November of 2015 have put 3800 mi on then, back is fine, but front is down to 3/32 on wear marks, iam not a happy camper, Michelin has been giving me the run around the back tire still looks good, I keep 40 to 42 psi in them, give it 2 star because back is good! Great Value, Ride And Performance! I have owned my bike since new and now have 135k miles on it. You might say I've been thru a few sets of tires in 20 years. :-) The Michelin Commander II is by far the best tire I've run to date! I installed these before heading out on a two-week trip thru CA, NV, UT, CO, WY, MT, ID, and OR for over 4k miles. They show no signs of wear at all and I travel quite heavy with gear on these trips. All kinds of weather encountered and the tires performed without hesitation. Most notable is the ride quality - best yet! I have my bike tuned for handling with a cartridge emulator front fork setup and high performance Progressive shocks in the rear. I'm used to the compromise this setup offers, but with the Commander II tires, a nice ride and good handling go hand in hand. When I find something I like, I stick with it. I will definitely order again when these are done... but by the looks of it, it won't be any time soon! 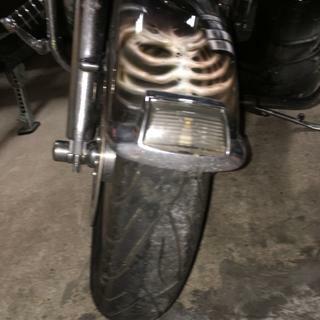 Installed on the front of a 1800 Goldwing. I took a 3200 mile trip to Colorado and ran in 90 degree weather, rain and a little wet snow and was very happy with the tire. Would buy again! 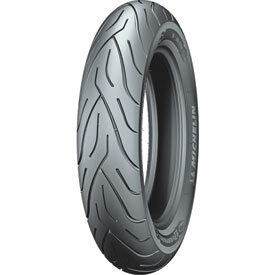 this tire wears great and has excellent traction..much better that the stock Dunlop tires .. Does Michelin provide suggested tire pressures or should I use OEM spec's even though these are not OEM tires I'm replacing? My Bike is a 2013 Harley Davidson Dyna FLD Switchback with ABS. BEST ANSWER: I believe that the pressure suggestion is printed on the sidewall. Run with OEM specs to start. If you feel you need to change for better performance, make small adjustments. Use the recommended tire pressure on the Michelin Commander tire. It is located on the sidewall. Always use OEM pressure recommendations. BEST ANSWER: 63H refers to the speed and load rating. This tire has a load rating of 600 pounds and a speed rating of 130 MPH. BEST ANSWER: The "B" in the tire size stands for Bias Belted which is the construction of the tire.